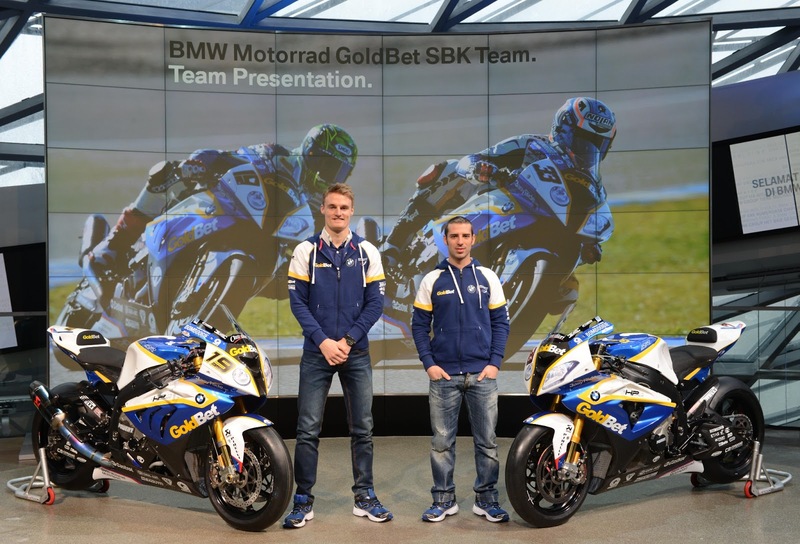 The BMW Motorrad Goldbet team have launched their campaign for the 2013 World Superbike championship in Munich near the BMW group headquarters. It was announced last year that the factory BMW team for 2013 would be run by previously satellite team BMW Italia, continuing with the Italian outfits sponsor, Goldbet. BMW Motorrad Italia is now responsible for the works team’s race and test outings, as well as work on the chassis. The power train and electronics are developed by BMW Motorrad in Munich. 2012 factory rider Marco Melandri remains with BMW and he would be joined by Welshman Chaz Davies, the 2011 Supersport champion having impressed in his debut WSB season on the ParkinGO Aprilia. Marco Melandri took the BMW S1000RR to it’s first World Superbike race victories in 2012, “Going into the season we certainly didn’t expect to pick up six wins and be in contention for the title right down to the final race. This year I am primarily looking to improve my own performances. I don’t want to make the same mistakes as I did in 2012, and want to make the podium more consistently,” said the Italian. The team will also line up in the European Superstock 1000 championship with reigning champion Sylvain Barrier and South African champion Greg Gildenhuys.